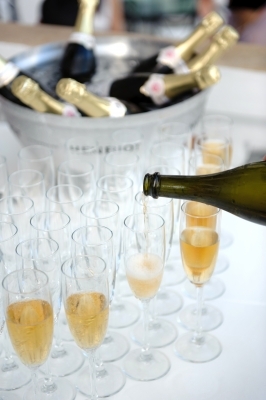 Champagne: Does it matter what we pop on New Year’s Eve? Last night I spent an inordinate amount of time crouched in my cellar eyeing up the limited selection of sparkling wines I’ve managed to collect. The objective? To decide what to open when the clock strikes midnight on New Year’s Eve. Should I open something expensive or affordable? French, English or other? Vintage or non-vintage? Blanc de blancs, blanc de noirs or a wider blend? Such quandaries are the sort of thing that drive wine enthusiasts round the bend but cause the more sane of mind to utter the words ‘middle class problems’. Touché. A trip to the typical British supermarket at this time of year can lead a person to believe that Champagne, or any sparkling wine for that matter, is the most popular drink in this country. It dominates the wine aisles, stands prominently at the end of the frozen foods section and often makes an appearance near the baked goods on a freestanding shelf designed to draw our attention. And then you have to pass another display as you head for the cashier. Much of this Champagne is reduced in price, often by as much as 50 per cent, in a stack ’em high, sell ’em low sort of fashion. Never before (at least in my life) has Champagne been so cheap, easy to acquire and, crucially, decent in quality. Growing up, champagne, spelled with a small ‘c’ because any fizzy wine with alcohol was a ‘champagne’ in my eyes, was something that we only ever drank on New Year’s Eve. Due to Canada’s high taxes and prohibition-era alcohol laws, the good stuff was expensive and all but unattainable. Most of the time, we drank something cheap and a little bit wretched, the sort of sparkling wine you left in the freezer as long as possible before it transformed itself into block of ice, so that the low temperature muted the flavours. Being from Canada, this was most often something cheap, awful and domestic, such as Baby Canadian Sparkling. Sometimes it was cava, which was a welcome respite. Back then, I didn’t actually like Champagne. I liked the idea of it. But not the taste. However, in the spirit of the night’s festivities, I forced it down my throat despite its paint-removing acidity. I did this in the same way that I had pretended to enjoy those glasses of harsh Canadian whisky that were served to me at Christmas. But today I find myself at the bottom of the steps in my cellar, hunched over a wine rack and trying to decide a much more palatable group of bottles. Some of them are the sort you’d expect to see a Russian oligarch opening in an ‘exclusive’ Mayfair club, while others gained a reputation as being the preferred tipple for City of London traders who were caught in the LIBOR fixing scandal. Can I really go wrong with any of them? No. But that’s the problem: they’re all a bit too flashy. And then I spotted it lurking below everything else: Lidl Champagne. Comte de Brismand Champagne Brut NV. It has been lurking in my cellar since I bought it in the first week of January last year, when I spotted it in a Lidl and thought, hey, why not? And that is the point. Why not? Dom Perignon, eat your heart out. EDIT: I have a bottle of Nyetimber Blanc de Blancs 2003 waiting in reserve just in case the cheap fizz burns the back of my throat. ← Christmas conundrum: How many bottles to bring to dinner?